Yawning is a bodily activity common in most of the vertebrates. It is also known as oscitation. In humans, it occurs as early as 20 weeks after conception. It also has been proved that it is contagious and we will most probably yawn when someone next to us does the same. It is even more contagious among people who are genetically or emotionally related. An average yawn lasts 5 to 6 seconds. There are many theories given by researchers to conclude why we yawn but the exact reason backed by proof has not been figured out yet. 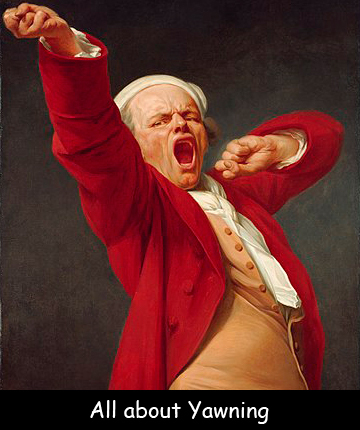 Yawning is somehow related to how tired we are feeling at that particular moment. It also seems to increase with boredom. Animals also yawn like we do. This physical phenomenon has been observed in primates. According to a study it has been concluded that people are more likely to yawn during the winter. This physical phenomenon becomes transmissible in the first 1 or 2 years of a person’s life. A recent study found out that yawning is originated from primitive reflexes in the primary motor cortex. This area of brain is responsible for motor functions. It sometimes allows us to think more clearly and have better ability to concentrate on things. It brings more oxygen into our bloodstream and simultaneously cleanse it of carbon dioxide. Declan, Tobin. " Yawning Fun Facts for Kids ." Easy Science for Kids, Apr 2019. Web. 18 Apr 2019. < https://easyscienceforkids.com/all-about-yawning/ >.